Power is considered to be a foremost driving force of development and economic growth. Almost all sectors of society depend on electricity to function. What happens, though, when the supply of power is not enough to support the demand? Does one have to wait in the dark? Signs of recovery from the recent economic downturn are increasingly becoming noticeable in many of the world’s economy. The South East Asia and Gulf Cooperating Countries, for instance, with its new-found economic and social buoyancy, is showing renewed aggressiveness in infrastructure projects and massive commercial and residential developments. Its neighboring region, the Indian Sub-continent, is also enjoying an upturn. According to a recently published market report from the Asian Development Bank, the South Asian region, to which the Indian Sub-continent belongs, is predicted to grow by 5.3% in 2014 and by 5.8% in 2015. In fact, India alone is forecast to achieve growth rates of anywhere between 5.5% and 6%. Since the industrial revolution, power has always been identified as a key factor in encouraging economic growth, and that has not changed till today. As the demand for energy exponentially increases in an expanding economy, with the spike in construction and utility infrastructure projects, and the rise in population and household and commercial consumption, the need to support the Sub-continent’s power requirements becomes ever more urgent. In order to sustain the region’s momentum, an ample supply of clean, viable and affordable energy is imperative. In this light, the Indian Sub-continent should be able to explore new energy sources and technologies that do not only promote energy efficiency but also environmental stewardship. It is worthy to note that some countries in the Indian Sub-continent are still experiencing challenges in the context of supporting electricity demands. Power failure, owing to several factors, including limitation in resources, low generation capacity, extreme levels of demand, and derated capacity of power station machinery, among others, has become an acute problem in several areas. Take Bangladesh as an example. An article from the Journal of Selected Areas in Renewable and Sustainable Energy, titled “Power crisis and its solutions through renewable energy in Bangladesh”, by Khairul Anam and Husnain Al Bustam of the Islamic University of Technology, reports that only 10% of Bangladesh’s rural households has access to electricity, and that some parts of the country will not be connected to the national grid until 2030. Despite the effort of the national government to add power generation units to the national grid, the areas that are connected to power sources are still suffering from severe load shedding. Even India is not saved from power distribution woes. Majority of the country’s supply is derived from thermal or hydroelectric sources, and with the country’s rapidly growing economy and population, power generation facilities are increasingly finding it difficult to cope up with the requirement. A manifestation of this was the reported failure of the Northern and Eastern grids, which put activities in cities such as Delhi to a halt. The negative effects of the two-day partial power outage was reportedly felt across several segments, most notably in the industrial sector. Moreover, several reports in national and regional publications cite that approximately a third of India’s population is not connected to electricity and that those that are experience regular power interruptions. Other countries in the Sub-continent, including Nepal and Sri Lanka, have similar stories to tell. In Nepal, the demand for electricity, which stands at 1,200 MW, cannot be supported by the local production of 750 MW during the rainy season and of 450 MW during the dry season. This has prompted the country’s government to declare a national energy crisis in 2008 and to form task forces to further explore the potential of hydropower in the next 20 years. In Sri Lanka, while nearly 60% of the population reportedly has access to electricity, much of the fraction is concentrated on the more developed Western Province, leaving the other areas with less than 30% access. Unstable electricity production and regular power interruptions bring about myriad negative impacts to a country’s economy, business and people. In today’s world, power is a fundamental element for any economy to function, as every sector of the modern society, be it domestic, commercial or industrial, is heavily dependent on electricity. Nowadays, a power interruption affecting critical facilities, like hospitals, airports, telecommunications towers, data centres and oil & gas installations, has the potential to put an entire country or region to a standstill, and in light of globalisation, the consequences may transcend national or regional borders. 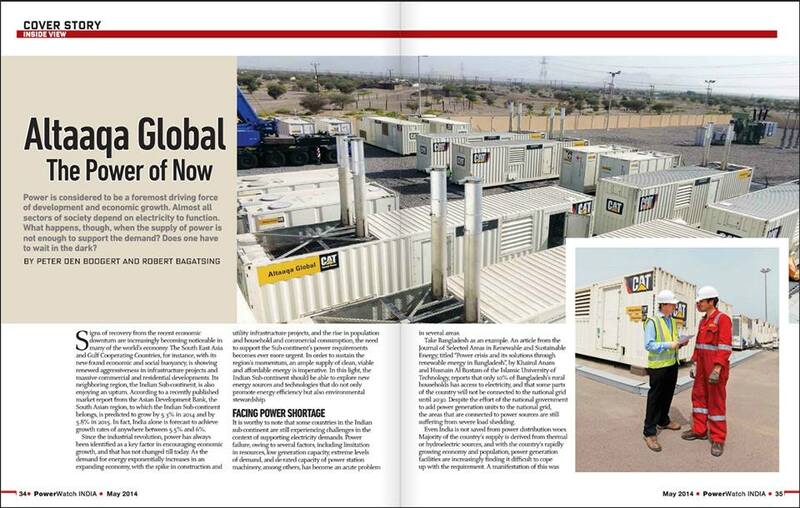 Altaaqa Global CAT Rental Power, the global provider of temporary solutions, recognizes not only the economic opportunities in the Indian Sub-continent but also the pressing need to provide innovative and creative solutions to the region’s pressing power needs. Altaaqa Global offers state-of-the-art interim power generation solutions that are viable, cost-effective and environment friendly. For instance, the company’s diesel generators are equipped with a fuel management technology that maximizes fuel efficiency while minimizing plant shut downs by ensuring that sub-standard fuel does not affect the system. Additionally, Altaaqa Global provides power generators with gas, diesel or dual-fuel technology, specifically developed to reduce fuel costs, hence a reduction in customer expenditure for electricity. It’s dynamic blending dual-fuel technology, combining 70% gas and 30% diesel interim power plants, not only cut back on power cost but also decrease operational emissions. Hiring interim power generation plants as a stop-gap measure yields many advantages, particularly when there is a foreseeable delay in the construction of permanent power generation facilities or when the spike in electricity demand proves to be seasonal. In the context of the above-mentioned case studies, countries in the Indian Sub-continent are looking to mitigate the observed deficiency in power supply by harnessing alternative sources of energy, including geothermal, solar, hydro and nuclear. While the afore-mentioned alternative sources have recognized and acknowledged merits and potential, they may require further research, legislation and physical facilities to be operational; and this may take time. In a study conducted by the Federation of Indian Chambers of Commerce and Industries in 2012, 61% of the companies that participated in the survey reported more than 10% in production short-fall due to power interruptions. Moreover, the participant companies also cited revenue losses between INR 1,000 and INR 40,000 per day, due to power cuts. The set-backs caused by power fluctuations are similar. 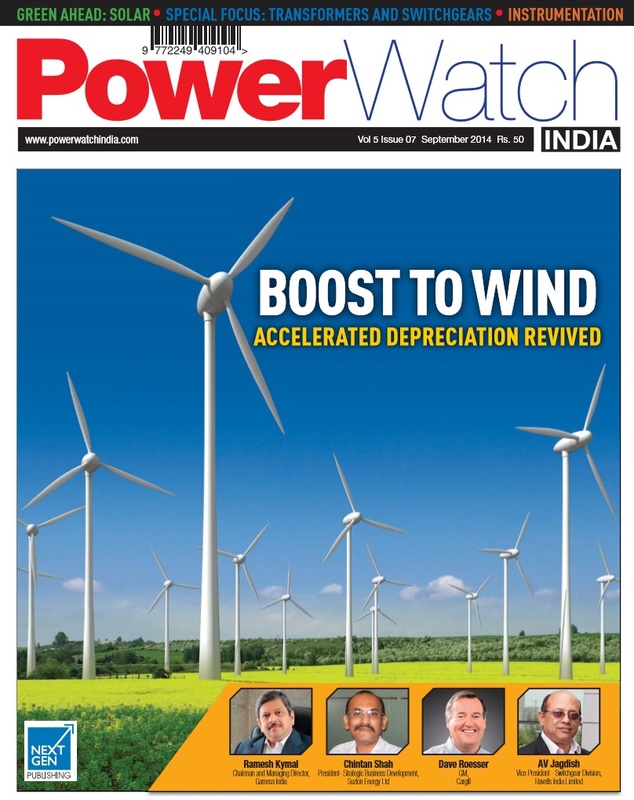 Naturally, businesses may not be able to survive operational losses of this magnitude while waiting for permanent power generation facilities to be functional. Needless to say, the situation calls for an urgent solution. 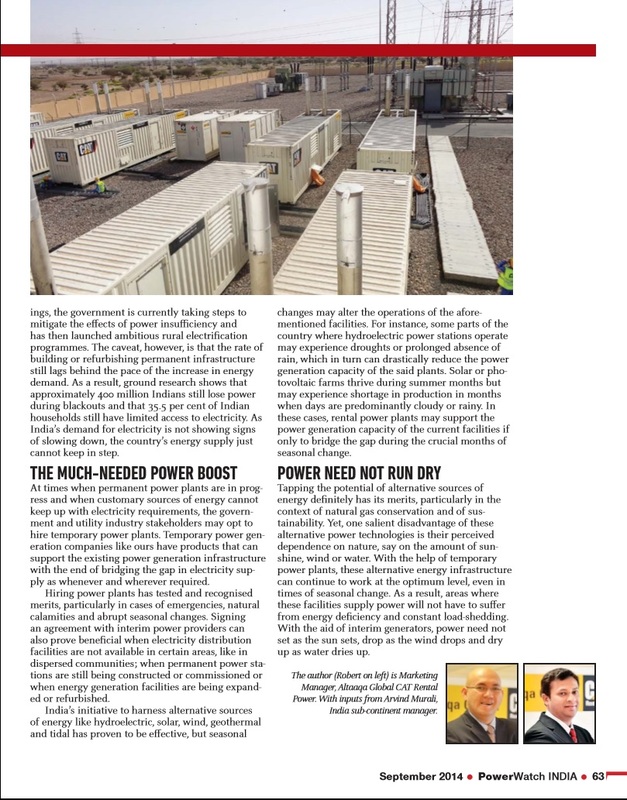 Rental power companies, like Altaaqa Global, are capable of providing solutions as needed, when needed. Utility companies can hire temporary power plants in times when demand outpaces the supply, when the electrical grid is unstable or when power distribution networks are unavailable. This will allow them to bridge the supply deficit without waiting for another day. Hiring power generators can prove to be a viable solution to power supply inefficiency, while the permanent power infrastructure is constructed. ‘Falsus in unum, falsus in omnibus’? Not all rental power companies are the same’False in one, false in all’ does not apply in choosing an interim power partner. While the selection of the temporary power technology to be required may be indicated by operational tendencies and budget allocation, the choice of a service provider may entail a keener investigation and a more discriminating process of evaluation and elimination. In choosing an interim power plant partner, utility companies in the Indian Sub-continent should consider a provider’s experience, support system, rate of deployment, and equipment reliability and sustainability before signing an agreement with it. A provider should have a proven track record in delivering executable, measurable and sustainable solutions to multifarious projects. The exercise of hiring a temporary power company will be counter-productive if the company does not have the technical experience to deliver what it promises. The rental company should have the spare parts and the human resources to carry out after-sales support to installed and commissioned projects at any given location. The interim power provider should have the capability to react, deploy, mobilise and commission temporary power plants at a moment’s notice. This means that the provider should have available equipment and manpower on the ground to carry out a rapid delivery. 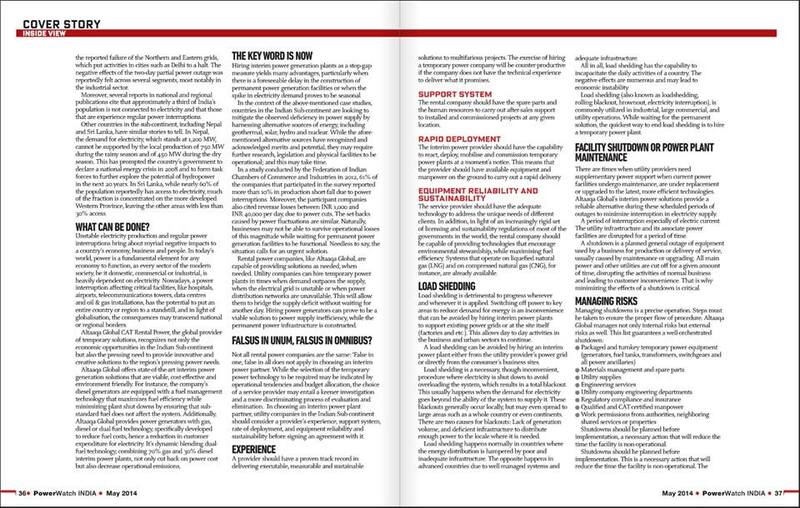 The service provider should have the adequate technology to address the unique needs of different clients. In addition, in light of an increasingly rigid set of licensing and sustainability regulations of most of the governments in the world, the rental company should be capable of providing technologies that encourage environmental stewardship, while maximising fuel efficiency. Systems that operate on liquefied natural gas (LNG) and on compressed natural gas (CNG), for instance, are already available. Altaaqa Global can provide the optimal solution to customer’s energy needs. Load shedding is detrimental to progress wherever and whenever it is applied. Switching off power in key areas to reduce the demand for energy is an inconvenience that can be avoided by hiring interim power plants to support existing power grids or at the site itself (factories, for instance). This allows day-to-day activities in the business and urban sectors to continue. Load shedding can be avoided by hiring an interim power plant either for the utility provider’s power grid or directly for the consumer’s business sites. Load shedding is a necessary, though inconvenient, procedure where electricity is shut down to avoid overloading the system, which, in turn, results in a total blackout. This usually happens when the demand for electricity outstrips the ability of the system to supply for it. These blackouts generally occur locally, but may even spread to large areas, such as a whole country or even a continent. There are two causes for blackouts: Lack of generation volume and deficient infrastructure to distribute enough power to the locale where it is needed. Load shedding normally happens in countries where the energy distribution is hampered by poor and inadequate infrastructure. The opposite happens in advanced countries due to well-managed systems and adequate infrastructure. All in all, load shedding has the capability to incapacitate the daily activities of a country. The negative effects are numerous and may lead to economic instability. Load shedding (also known as rolling blackout, brownout or electricity interruption), is commonly utilized in industrial, large commercial, and utility operations. While waiting for the permanent solution, the quickest way to end load shedding is to hire a temporary power plant. There are times when utility providers need the support of supplementary power when current power facilities undergo maintenance; are under replacement or are being upgraded to the latest, more efficient technologies. Altaaqa Global’s interim power solutions represent a reliable alternative during these scheduled periods of outages with the aim of minimizing interruption in electricity supply. A period of interruption, especially of electric current, means that the utility infrastructure and its associate power facilities are disrupted for a period of time. A shutdown is a planned general outage of equipment used by a business for production or delivery of service, usually caused by maintenance or upgrading. All main power and other utilities are cut off for a given amount of time, disrupting the activities of normal business, which may lead to customer inconvenience. That is why minimizing the effects of a shutdown is critical. Shutdowns should be planned before implementation, a necessary action that will reduce the time the facility is non-operational. The above approach is vital because maximizing the maintenance will shorten downtime. Resourcefulness, creativity and collaboration between everyone involved is important in minimizing the outage period. Hiring a temporary power plant during times when peak production is high, to augment the existing power supply, is an option industrial companies can choose to take. There are also times when utility companies set ceiling caps for electricity consumption or when they charge you extra during peak hours. It is then more economical to hire a temporary power plant to ensure production is continuous. In your peak production month, the utility company tells you: “Lower your power consumption or you will pay a hefty penalty!” Will you sacrifice opportunity? We can provide a load lopping solution that will guarantee the continuance of your production without paying a penalty. Factory A uses the same amount of power as Factory B. The difference is that Factory A uses in two days what Factory B uses in a month. Therefore, Factory A will pay more because they will require more energy in those two days and the utility company has to get pricier, higher capacity equipment to be able to supply the needed power. Some resort to reduce peak demand just to avoid production delays. A factory can choose to shut down parts of the complex when consumption is high. 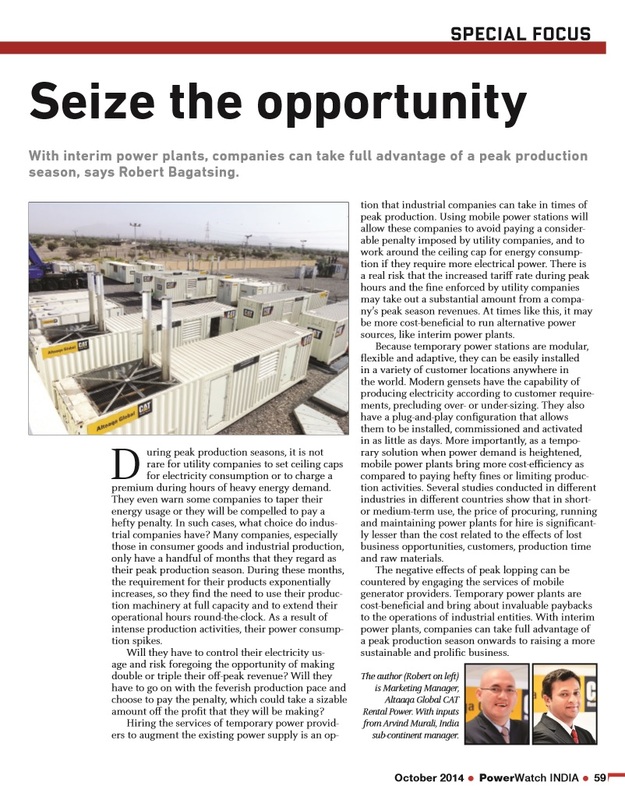 The downside associated with peak lopping can be prevented by hiring temporary power plants. It is more cost-effective than upgrading the existing system and the long-term benefits are immeasurable in terms of the impact on the day-to-day activities of the domestic and industrial sectors. When factories, industrial zones and tourism areas experience interruptions in electricity, the serious effects to the economy can adversely affect growth and eventually lead to severe losses. Causes of emergency power generation may be attributed to natural disasters, accidents and situations where the human factor is involved. Whatever the cause of the power interruption, Altaaqa Global can rapidly deliver a temporary power plant on short notice. Emergency power is required when the current power supply is inaccessible and a quick solution is immediately due. There are cases where utilities experience energy shortages because of reduced power from a next-door country. This may happen due to technical failure or an unexpected contractual change. Whatever the case is, consumers urgently require additional electricity either for base load, continuous operation or for emergency back-up and, hopefully, manage the situation. Altaaqa Global’s temporary power products and technologies are the most efficient solution for a fast-track capacity application because their modular design has been custom engineered for rapid mobilization and start-up. We guarantee energy when you need it. Fast. 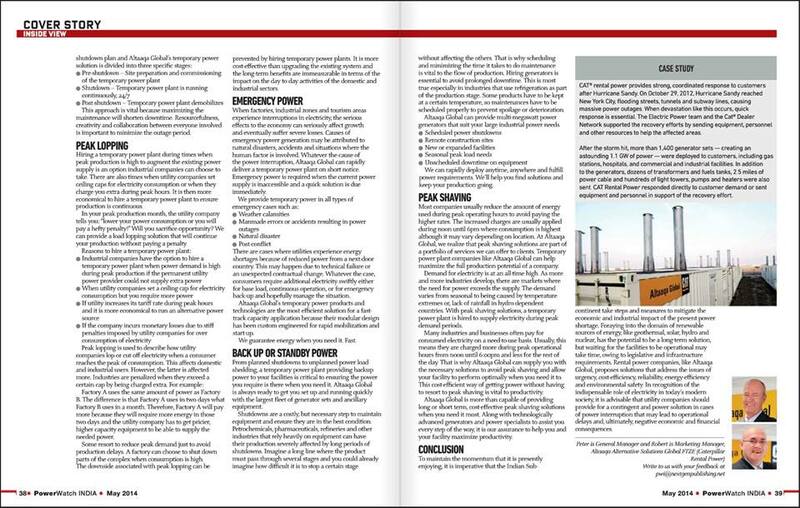 CAT® rental power provides strong, coordinated response to customers after Hurricane Sandy. On October 29, 2012, Hurricane Sandy reached New York City, flooding streets, tunnels and subway lines, causing massive power outages. When devastation like this occurs, quick response is essential. The Electric Power team and the Cat® Dealer Network supported the recovery efforts by sending equipment, personnel and other resources to help the affected areas. From planned shutdowns to unplanned power load shedding, a temporary power plant providing backup power to your facilities is critical to ensuring the power you require is there when you need it. Altaaqa Global is always ready to get you set up and running quickly with the largest fleet of generator sets and ancillary equipment. Shutdowns are a costly, but necessary step to maintain equipment and ensure that it is in the best condition. Petrochemicals, pharmaceuticals, refineries and other industries that heavily rely on equipment can have their production severely affected by long periods of shutdowns. Imagine a long line where the product must pass through several stages and you could already imagine how difficult it is to stop a certain stage without affecting the others. That is why scheduling and minimizing the time it takes to do maintenance is vital to the flow of production. Hiring generators is essential to avoid prolonged downtime. This is most true in industries that use refrigeration as part of the production stage. Some products have to be kept at a certain temperatures, so maintenance operations have to be properly scheduled to prevent spoilage or deterioration. Altaaqa Global can provide multi-megawatt power generators that suit your large industrial power needs. We can rapidly deploy anytime, anywhere and fulfill power requirements. We’ll help you find solutions and keep your production going. Most companies usually reduce the amount of energy used during peak operating hours to avoid paying the higher rates. The increased charges are usually applied during noon until 6pm where consumption is highest although it may vary depending on location. At Altaaqa Global, we realize that peak shaving solutions are part of a portfolio of services we can offer to clients. Temporary power plant companies like Altaaqa Global can help maximize the full production potential of a company. Demand for electricity is at an all-time high. As more and more industries develop, there are markets where the need for power exceeds the supply. The demand varies according to seasons, caused by temperature extremes or lack of rainfall in hydro dependent countries. With peak shaving solutions, a temporary power plant is hired to supply electricity during peak demand periods. Many industries and businesses often pay for consumed electricity on a need-to-use basis. Usually, this means they are charged more during peak operational hours from noon until 6:00pm and less for the rest of the day. That is why Altaaqa Global can supply you with the necessary solutions to avoid peak shaving and allow your facility to perform optimally when you need it to. This cost-efficient way of getting power without having to resort to peak shaving is vital to productivity. Altaaqa Global is more than capable of providing long or short term, cost-effective peak shaving solutions when you need it most. Along with technologically advanced generators and power specialists to assist you every step of the way, it is our assurance to help you and your facility maximize productivity. 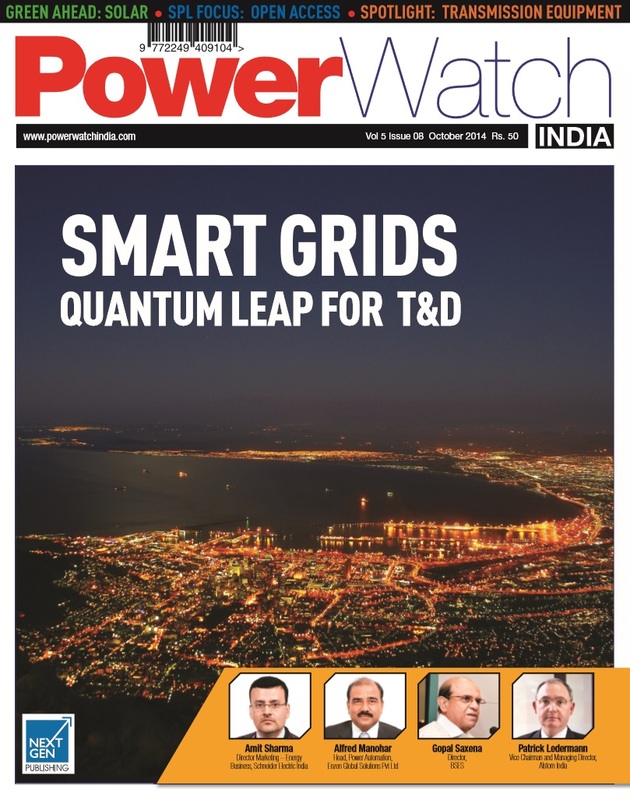 To maintain the momentum that it is presently enjoying, it is imperative that the Indian Sub-continent take steps and measures to mitigate the economic and industrial impact of the present power shortage. Foraying into the domain of renewable sources of energy, like geothermal, solar, hydro and nuclear, has the potential to be a long-term solution, but waiting for the facilities to be operational may take time, owing to legislative and infrastructure requirements. 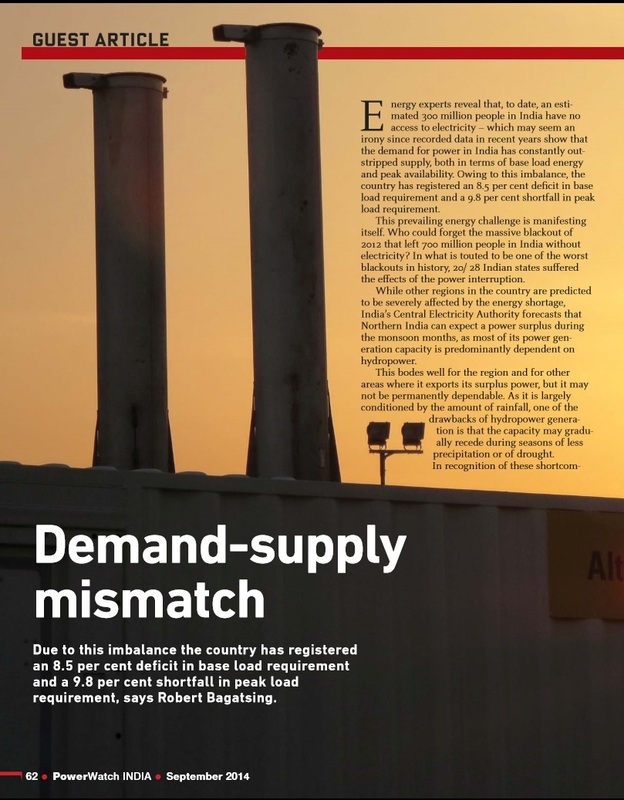 Rental power companies, like Altaaqa Global, proposes solutions that address the issues of urgency, cost-efficiency, reliability, energy-efficiency and environmental safety. In recognition of the indispensable role of electricity in today’s modern society, it is advisable that utility companies should provide for a contingent and power solution in cases of power interruption that may lead to operational delays and, ultimately, negative economic and financial consequences. 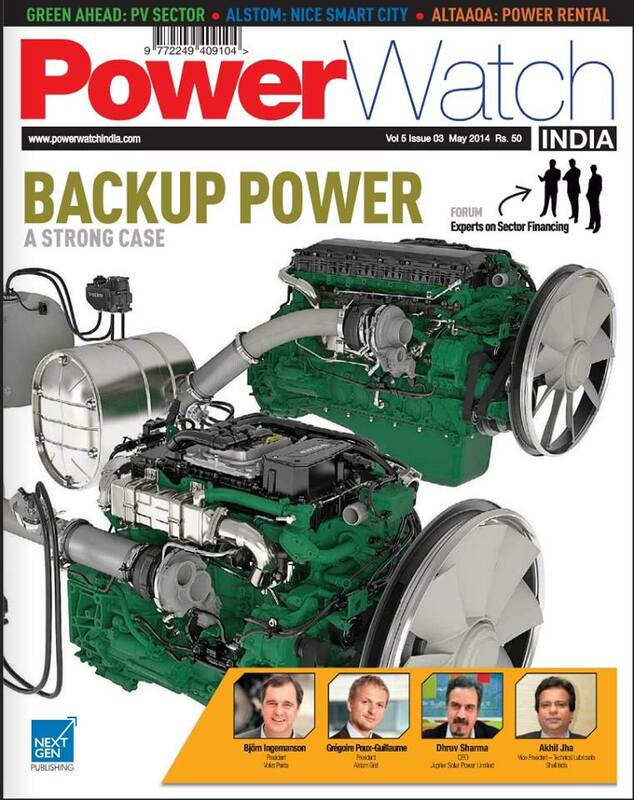 The foregoing article was originally published in the May 2014 issue of Power Watch India.